I was quite sad to see this card get nerfed. But at least the golden Dreadsteed I crafted could give me one final service, to be mashed up and used to make a golden Shadowreaper Anduin. Gallop on my noble horse. I'll be sure to recraft you...eventually. Why couldn't they have just limited the Defile cast, like they added limits to Unearthed Raptor. That would've allowed keeping Dreadsteed. This is a combo that would work in Wild if Dreadsteed wasn't nerfed. Play Deathspeaker, battlecry targetting Knife Juggler. And Thaurissan tick only need to affect one of those cards. This is RIDICULOUS Blizzard, give back to us the good old Dreadsteed! The Defile interaction could be fixed in many other ways! It could, but apparently Knife Juggler + Deathspeaker + Dreadsteed + Defile is a group of powerhouse. Does anyone know if Dane's Noggenfogger Dreadsteedlock will be playable after the nerf? I mean the combo with spiritsinger Umbra: will she summon infinite copies of Dreadsteed at the end of a turn or only one? I will test this as soon as the new expansion is released. 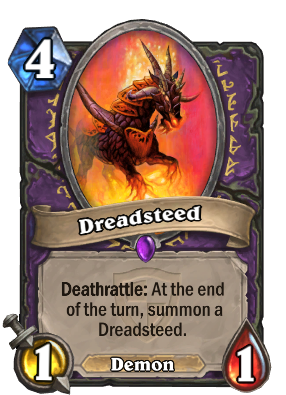 Dreadsteed now says "Deathrattle: At the end of turn, summon a Dreadsteed." So, RIP the infinite combo. do we get dust ? I am wanting to craft this card but cannot find it anywhere to do so. I have looked in wild cards, standard cards, legendary cards, warlocks cards, did a search on dreadsteed using the crafting button. How does one go about crafting this card? I cannot find the dreadsteed to craft it for my deck. I have done a search in standard cards, wild cards, all cards, warlock cards, legendary only card, and I cannot find it. How does one go about getting this card? Why are there 29 pages of discussion about this card? If only this were a rouge card... If only.